Visual Lure recently re-designed and launched AdamsAuctions.com. 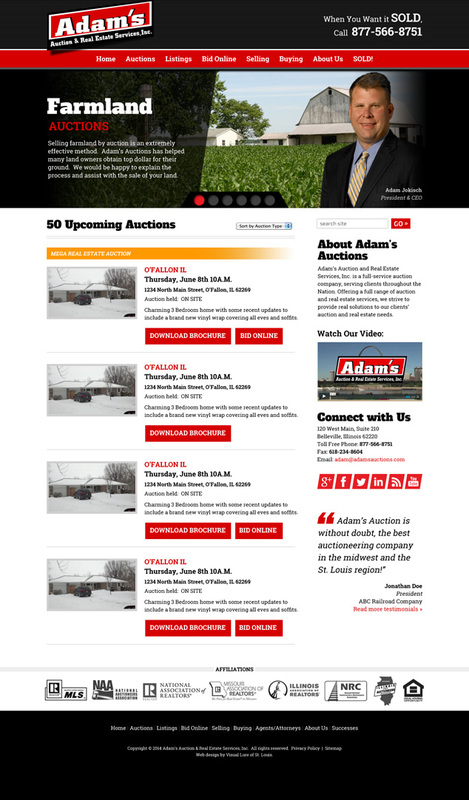 Adam’s Auction and Real Estate Services, Inc. is a full-service auctioneering and real estate company located in the St. Louis Metro East, serving Illinois, Missouri and nationwide. Their auctioning categories include real estate, estates & consignments, bankruptcies & business liquidations, railroad/industrial and charity events. Adam’s recently had their website re-designed by another company just this year, but it could not be found on search engines, it did not match their brand, and customers complained about it not being mobile and user-friendly. So Adam’s Auctions contracted Visual Lure to get it done right. The new website (built in WordPress) is now simple to use, a responsive design that makes the site look and function great on desktop computers, tablets and smart phones, and it ties seamlessly into their very complex auctioning software making it easy for staff to maintain. If you don’t want to have to re-design your website right after you’ve had it re-designed, then GET IT DONE RIGHT THE FIRST TIME by giving Visual Lure a call today. All our websites are search engine friendly & optimized, responsive, aesthetically pleasing and quick loading for a great overall user-experience.